Wildcrafting, or gathering plant material from its native "wild" environment is becoming very popular. Many local herbalists and wildcrafters are concerned about damage to our resources. A well-trained wildcrafter should never damage or deplete our inheritance from nature. A few actually intend to damage the environment for personal gain, but those folks will not be swayed by one article on the internet. The majority of the wildcrafters are looking for a way to connect with nature for the day, have fun, and finish with some plants for food, medicine, fiber, or art. These wildcrafting guidelines are for you. Included in this article is a Wildcrafting Checklist that you can print and carry with you into the field. Use it every time you harvest. It will be difficult to answer all the questions. Some questions will require returning to the site every year for a couple of years. If you can't figure out if your population of plants (plant stand) is growing or shrinking, or if it's being eaten by elk, don't worry. Just be aware of these thoughts, and try to answer them as time goes on. The biggest mistake most new wildcrafters make is harvesting the first good patch they see. There is no hurry. There may be an even better stand over the next hill or around the bend in the river. Please don't wildcraft on a busy schedule, or you'll miss many beautiful lessons that nature has to offer. Your emotional state will greatly affect your plant and habitat locating abilities. Concerns, fears, and a constant replay of yesterday's traumas will cloud your awareness of the signs around you. When you're upset, you are more likely to miss obvious animal clues, get lost in thick shrubs of the ever spiny Devil's Club, Oplopanax horridum, or even fall off a cliff. Many places of power are inaccessible without a proper emotional state. No rock climber in their right mind would attempt a difficult ascent without a centered consciousness. The same applies to plant hunters. One must approach the earth with openness and respect if you expect to learn anything from it. If you obtained a permit from a public agency to harvest from our public lands, you agreed to harvest a specific distance from roads and trails. Follow this sound regulation on private land also. People hiking (and to some extent driving) through the forest often wish to experience the beauty of wildflowers. Most will never leave the trail. Even if you pick a wildflower that grows back next year, someone may not learn of its special charm this year. Wildcrafters and administrators will try to find an exact distance, but I suggest hiking until you no longer see the trail. Walking out of sight will help make your harvest invisible. A successful wildcrafter leaves fewer marks on the stand than a foraging animal. Very few human eyes will follow you off the human highways, and feeling as if you're the only folks in the woods makes it even more enjoyable to wildcraft. Some plants are not damaged easily, and should be the first choice of a wildcrafter. Blackberry, Rubus sp., and Dandelion, Taraxacum officinale, are two that are nearly impossible to eliminate, even if you dig their roots. If a piece of root stays in the ground, it will grow back. Yarrow, A_chillea millefolium_, can be cut with a lawnmower and still flourish regularly. Nettles, Urtica spp., when grown for fiber can have 3-4 aboveground harvests in a growing season. Plants that fit into this category are generally perennials. You can pick them and not threaten their survival. Endangered plants are species in danger of becoming extinct in the foreseeable future. Threatened plants are likely to become endangered in the foreseeable future. A species can be threatened or endangered throughout its range, which means if it goes extinct we will lose its hidden secrets forever. Many of these plants only grow in one special area (endemic). The Columbia Gorge on the border of Oregon and Washington hosts many endemic species. Peck's Penstemon, Penstemon peckii, grows only in the Ponderosa Pine Forest in Deschutes and Jefferson Counties. A species can also receive protection for part of its range. Newberry's Gentian, Gentiana newberryi, has stable populations in California, but is listed as threatened in Oregon. Deschutes County is at the end of its range, and there are less of them. Rare plants have small, localized populations. They may not be listed as threatened or endangered if the populations are both stable and numerous. Your own local Natural Heritage Program may have a web page, check it out. Do not pick protected plants. Unfortunately, they are not always easy for an amateur to identify. They are not always showy. There may be large amounts of them in one spot, so that they appear plentiful. There are some good picture books available. All folks who pick plants from the wild should try to familiarize themselves with the local protected plants. When in doubt, don't pick it. Some plants are sensitive to disturbance. Please do not pick them even if they aren't protected. The Calypso Orchid, Calypso bulbosa, is a fragile plant that lives partially off leaf mold. Its little root is close to the surface, and easy prey to slugs and others. Minor disturbances can easily dislodge the root from the mold. If someone picks its flower, it can ooze fluid and essentially "bleed" to death. Even disturbing the area around it during flowering could kill it. The law does not protect this plant because it is too numerous. It is our responsibility to help sensitive plants survive. How can you tell if a plant is sensitive? Most plants that are not green (contain no chlorophyll) are "no picks." These weird species are white, brown, red, or purple and just plain eerie. Botanists call them parasites or saprophytes. They are particularly fascinating. These include Broomrape, Orobanche sp., Coral Roots, Corallorhiza sp., and Indian Pipe, Monotropa uniflora. Other "no picks" include the Orchid Family (Orchidaceae) and almost all the Lily Family (Liliaceae). The Orchid Family includes Calypso Orchid, Calypso bulbosa, and the Rein Orchids, Habenaria sp. The Lily Family includes Trillium, Trillium ovatum, and Mariposa Lilies, Calochortus sp. These families are easy to recognize with a little practice. Not every Lily and Orchid is sensitive, but it's a good place to start. Most (but not all) of the unusual or showy plants are no picks. If you are not sure, don't harvest it. Many books and government permit guidelines suggest harvesting 1 in 3 (33%) or 1 in 4 (25%). This has been an acceptable amount for many years. I never harvest this much of a stand. The stand is drastically changes in appearance, no matter how you pick. Even if the plants regenerate in a year or too, the visual impact alone is extreme. It changes the ecological balance by letting in light, warming the soil, etc. One in ten (10%) is the best ratio to go by. This leaves most of the stand for reproduction and wildlife, and minimally impacts the ecosystem. All these harvesting ratios are generalizations and numbers that I personally never use. Each plant and ecosystem is unique in the amount and kind of harvesting it can handle. If you have to limit yourself to 1 in 10, then you are at the wrong stand. The best thing to do is locate a stand much larger than your needs, and then select some of the finest plants out of many. It is unusual for me to pick more than 1% of the stand, even when I collect a pickup truck full. No matter what percentage of the stand you can pick, you should never harvest more than you can process and use. This seems obvious, but beginners often blindly pick as much as possible. Washing and cutting Oregon Grape Root, Berberis nervosa, can take as long or longer than the harvesting process. The root becomes very hard after a day or two, and a hacksaw may be required if you don't process it immediately. 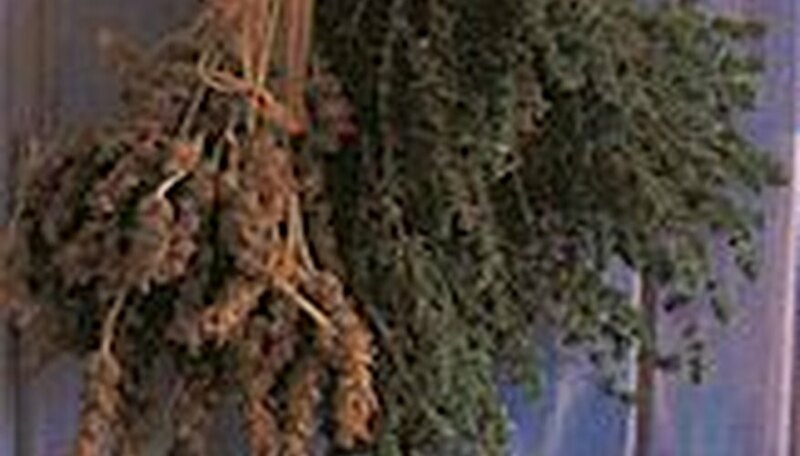 Plants will lose potency while waiting to be placed in the herb dryer. Large clumps of Valerian, Valeriana sitchensis, are quickly removed from a middle elevation meadow, but washing the roots may take five times longer (or more if its a grassy clump). Even dried herbs have a shelf life. Every time my apprentices harvest anything, I ask them what "wildcrafting is stewardship" means to them. The answers become personalized for each individual. To me, it means if you take care of the earth, the earth will take care of you. I am a caretaker of these wild plants, returning year after year to many places to watch and protect the plants that support me. Perhaps this year you will find a personal meaning for this phrase also. nearby at any time of the year?